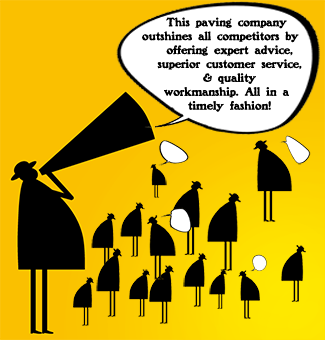 In the asphalt business, referrals can be vital to your success. From homeowners who ask their neighbors who re-did their driveway to large government contracts, recommendations from others can pull in a large percentage of your business. Asphalt jobs are big – even a new driveway in the neighborhood is noticed. Our work is outside for all to see and judge. Ours is an ideal business niche for cultivating a peppy referral program to attract new business. • The first thing you must do is earn referrals. Intentionally create a referral environment around your business. You do that by providing excellent, hassle-free, on time results. That’s the platform upon which you build a referral base. There’s no skimping on this step. If you are weak on cleanup or chronically late or us mediocre materials, you do not deserve referrals. It really is that simple. • Promise your customers that your work will be so excellent, they will want to give you referrals. This tactic can help close a sale, because such an assertion displays confidence and competence. And, you end up with referrals! This is especially applicable to the asphalt business, where we must constantly fight against the damage caused by unscrupulous, hit-and-run driveway con artists. When you assure a customer that you will be working with him and in touch over the long run, it goes a long way toward alleviating his fears about your stability. Ours is a business where people have trust issues, and they want to do business with someone they can trust. Using referrals, you essentially borrow the trust of your satisfied customers to pass along to their friends. • Ask people for referrals – straight out. People are traditionally reluctant to give out the names of their friends to vendors. They are afraid you might pester their friends or become an irritant to them. It pays to assure your customers that you will not embarrass their friends. Tell the customer exactly what you plan to do, whether it’s a single phone call, or a mailer, to ease their fears. Yes, it can be difficult to ask. Some people feel awkward asking for what amounts to praise or a compliment. If this is a problem for you, work to get past it. There is no harm in asking! Seize the moment if a customer pays you a compliment. Ask them if they would be willing to put the compliment in writing! • Ask customers if they would be willing to write a testimonial of satisfaction with the quality of your work. Testimonials send a powerful message to those who are shopping around, and can be a great way to keep your web site fresh, for example – adding new comments from satisfied customers. • Develop an educational plan that quickly and simply explains what you want. Be specific. “I am looking for homeowners like you…” “Do you have friends who play tennis?” (if you pave tennis courts). One excellent tactic is to prepare a small flyer that explains your referral program, what you do, what you would like the satisfied customer to do, outline any reward system you may have and so on. When you hand people a piece of paper, they have to handle it – file it, stash it, poke it in a drawer. Sure, some might toss it in the trash, but they are more reluctant to pitch it if there is some value or reward incentive potential in your program. Or, hand your customers a “suggested” letter they might want to sign and send along to a friend. Include a stamped envelope, of course. Ask each customer to fill in a survey that asks direct and specific questions about their satisfaction levels with your work. Give each customer three or four of your business cards to pass along. If you can afford it, give each customer a mug, T-shirt or ball cap that has your logo on it. If your branded gift is clever or cool, you will see them around town – and that’s a great plus! • Consider a rewards program to encourage referrals. This could range from a $10 gift card at a coffee house to a discount on your service. If you want to explore the gift card route, be sure to try to make a deal with the coffee house or vendor. They might sell you a $10 card for $5 just to help build their traffic. Send your customers a thank-you-for-the-business note as a follow-up, and again, ask for referrals. • Follow up is an important factor in any successful referral program. If a customer does give you a name, follow up and make the call. If the referral turns into a client, follow up with the original customer with a thank-you call or a note or even a small gift. Look at the concept of referrals from your customers’ point of view. Why should they try to help you? There is risk for them to refer you. What if you do a poor job for their friend? Or something just goes wrong? Why should your customer take on that risk? These are all questions you need to think through as they apply to your specific business and unique market. The top two reasons for failure to sustain a robust referral program are failing to ask the customer for referrals and failing to help the customer remember to refer you. Never lose sight of the fact that the top 20 percent of your customers generate 80 percent of your revenue. It is this top 20 percent where you need to focus your efforts. An active referral programs is by far the cheapest way to acquire new customers. Sure, some referrals just happen. But an aggressive and intentional referral program dramatically increases the number of leads you get. And, the nature of the referral customer is new business – new customers, the best kind.